De-stem kale and strip herbs quickly and easily with one well-made tool. 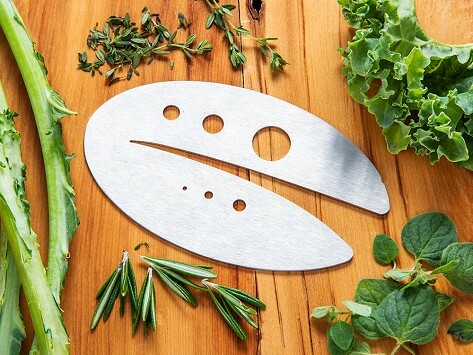 Crafted from stainless steel and Made in the USA to last a lifetime, the Kale Razor’s sharp blade shears off kale, collard, and mustard green leaves, and it has six differently sized holes to strip herbs like rosemary and thyme. Dimensions: 2.75" x 4.5" x 0.06"
I absolutely LOVE this "gadget"! I do a lot of dehydrating of kale, collard greens, sage, thyme, and I couldn't do so well without this handy tool. What a great invention! Onsce I find someone who likes to cook as much as I do, I'll buy one for them. Bought for a friend who uses a lot of homegrown herbs and greens. Just loves her "new toy". I bought this as a Christmas stocking stuffer for my husband and it's been awesome for both of us in the kitchen. Raw Rutes has created a better way to de-stem kale. And their handy kale razor pulls double duty as an herb stripper, too. The Buffalo-based team is all about making cooking and kitchen prep easier. Their smart little tool is a great example of their well-made approach. The Kale Razor and Herb Stripping Tool is Made in the USA with stainless steel, of which 60% is recycled material that is locally sourced whenever possible. The tool feels good in your hand—it’s well-balanced and sturdy. The super-sharp blade quickly removes kale leaves from the stalk, and it works great with mustard, collard, and other leafy greens, too. Six integrated holes strip various herbs, like rosemary and thyme, without you having to reach for another tool. These prep tasks are easier and quicker—and more satisfying, too—with this razor in hand.